Bard StatLock Universal Plus Stabilization Device allows for suture-free stabilization of biliary and nephrostomy percutaneous drainage and peritoneal lavage catheters. Advanced technologies and StatLock device design sophistication combine together to provide skin safe, releasable stabilization of even the most lubricious catheters. - Prepare the targeted securement site with alcohol or Chloraprep solution to degrease skin. Then apply skin protectant solution for enhanced adherence and skin protection. Allow to dry completely for 10 to 15 seconds. 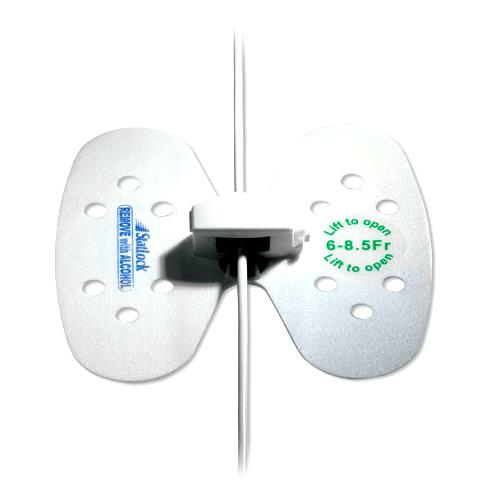 - Wipe catheter with remaining skin protectant (so it is wet for insertion into the StatLock device retainer). 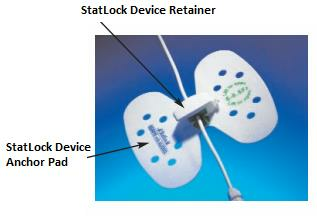 Note: Always secure catheter to the StatLock device retainer before placing pad on the skin. - Bring the StatLock device anchor pad into position. Stabilize the catheter between fingers and then double tug catheter to stretch-fit into the retainer. - Peel away the StatLock Universal Plus stabilization device paper backing one side at a time. - Place on the skin. - Open the StatLock device retainer by pressing tab and lifting lid. - First, lift the edge of anchor pad using 3 to 4 alcohol pads. - Then continue to stroke undersurface of the pad with alcohol to dissolve adhesive anchor pad away from the skin. Note: Do not pull or force pad to remove. Observe universal blood and body fluid precautions and infection control procedures, during the StatLock Universal Plus stabilization device application and removal. Always apply the adhesive strip to central venous and arterial catheters at or near the insertion site when using a StatLock Universal Plus catheter stabilization device.